Making Mad Ideas a Reality! A collaboration between Olivia and Ginge Fullen from the U.K.
A few months ago a friend from the UC Mountaineering Club asked me to serve as a graphic designer for an expedition that he was apart of. 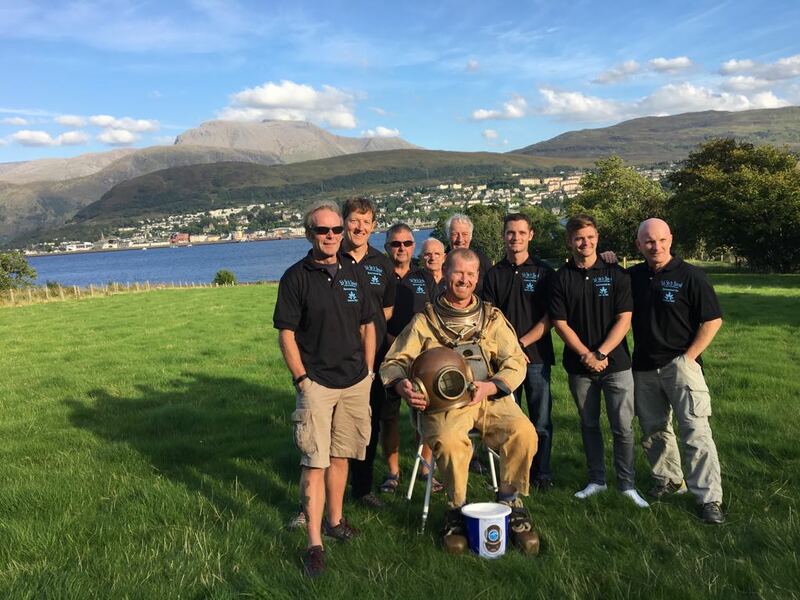 The adventure was to take place in Scotland, starting 16ft underwater and ending at the Ben Nevis summit, the highest point in the U.K. to raise money for charity. 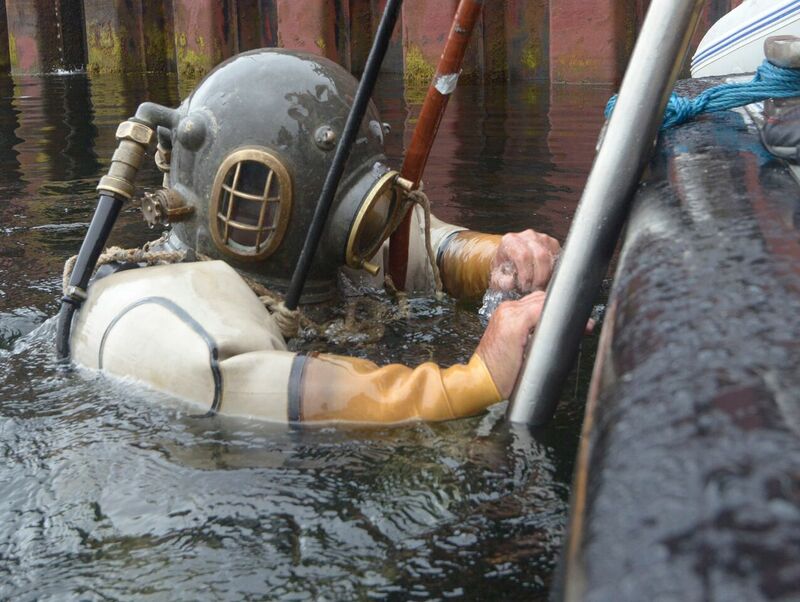 Oh, and to make things more difficult they took turns wearing an 176lb antique diving suit. Who on earth is responsible for this insanity, I thought. And the answer is Ginge Fullen. 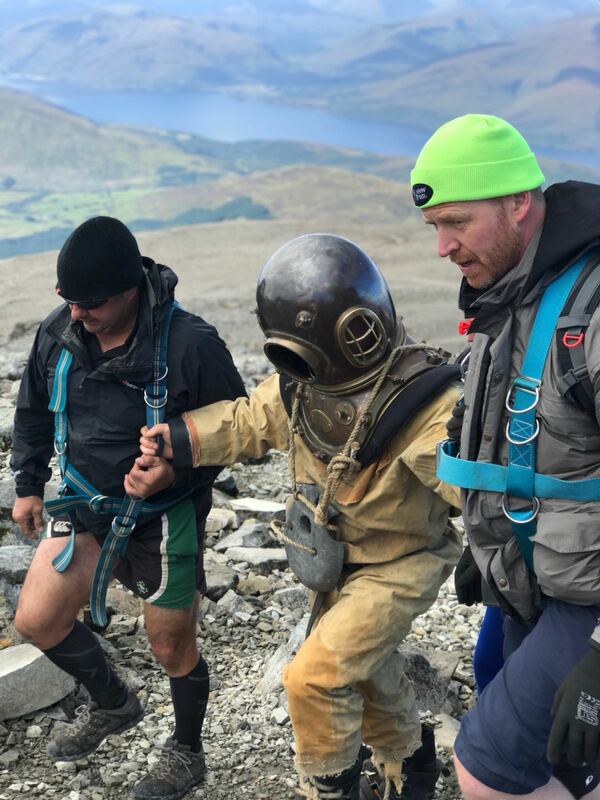 I encourage you to click on this link to read more about the man who spent 20 years in the British Navy as a Clearance Diver, survived a heart attack on Mt. Everest, has two Guiness World Records for the fastest climbing of every peak in Africa and Europe, amongst others. I am so honored to have worked so closely with Ginge so closely to create a logo and posters for the event. 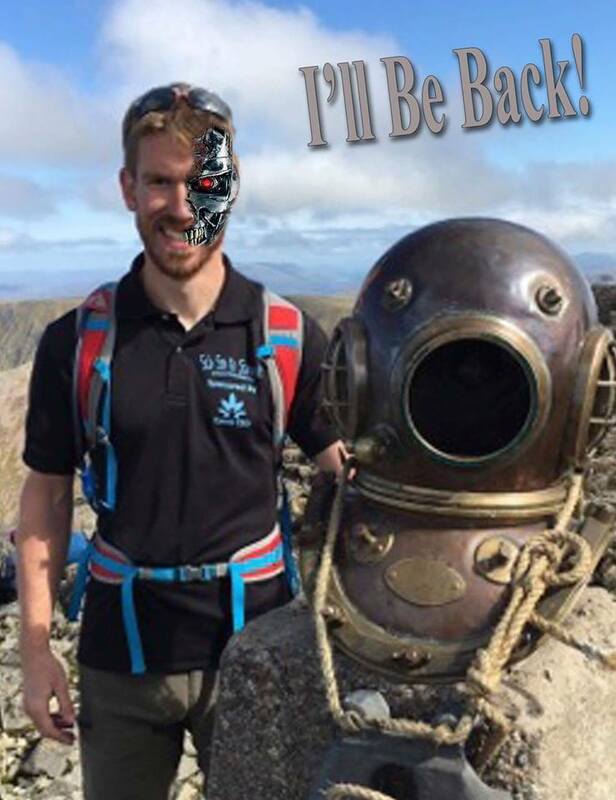 The following is an inspiring article written by Ginge about overcoming all odds during his Sub Sea to Summit dream. 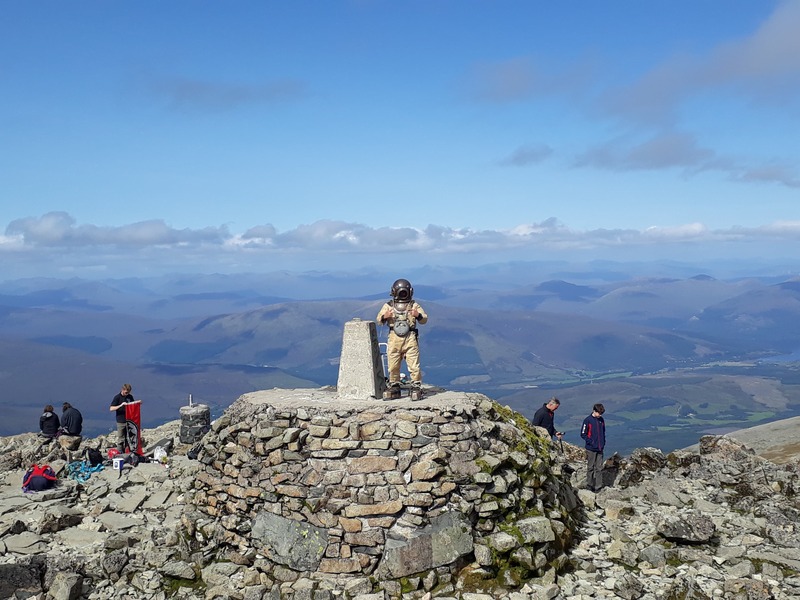 A never before… and probably never again walk up Ben Nevis, the UK’s highest mountain in Historical Diving Equipment weighing over 176lbs. It began at minus 16 ft in Loch Linnhe and finished at the summit of Ben Nevis. A total climb of 4,430ft. It was hoped to raise £4430 i.e. a pound for every foot gained. Barring death I did not see any real problems at all in climbing this mountain after all no simpler a plan has been made and no harder a trip undertaken. Can we do it, well we didn’t know if we could not! There are no unrealistic goals, only unrealistic deadlines after all. I would like to say thanks to the team. Yes for all the hard work but mostly because whenever I climb another mountain I will smile and say to myself – It could be worse! Into the unknown – Making mad ideas a reality! Make no doubt the walk started off brutal and got steadily worse. If it was only difficult though then it might have been done before. The Navy would not really back it officially in case someone died I think. People will and did ask the question why, those who asked though will probably never understand the answer. The answers are many and different for each person though. 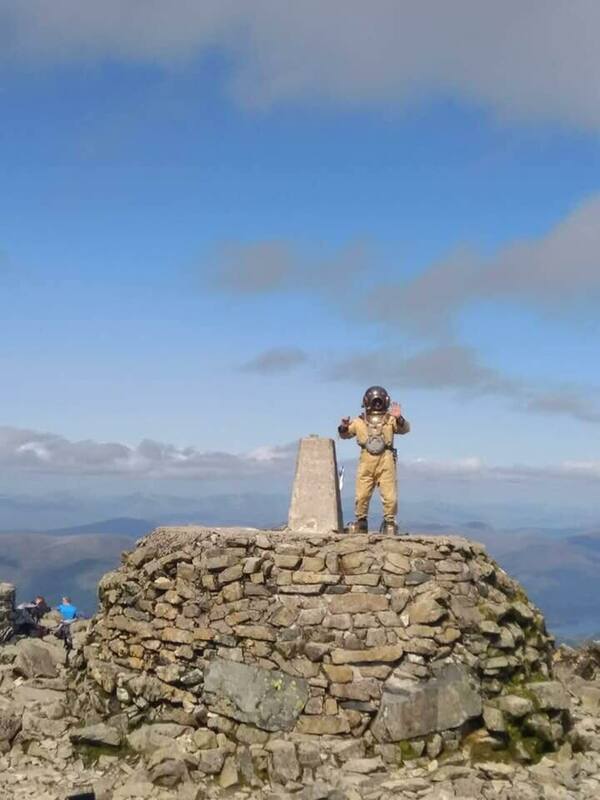 The simple answer of why walk up Ben Nevis in Standard diving equipment was for me; so nobody else has to. I had the idea for many, many years but the time to realize dreams is getting less and less of course. After finishing a 5 year project to climb the highest peaks in the 53 countries in Africa I wrote; unfortunately the world is too big for just one life time. Now is the time to do things, write them down and dream beyond what you think is possible. 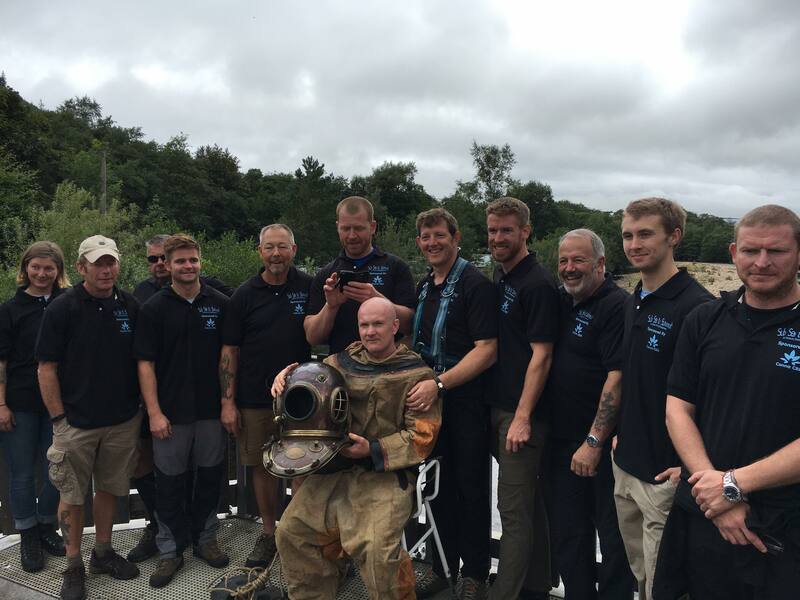 I met Ty Burton, a tough, ever positive Welshman a couple of years ago during a dive in Stoney Cove in standard diving equipment. 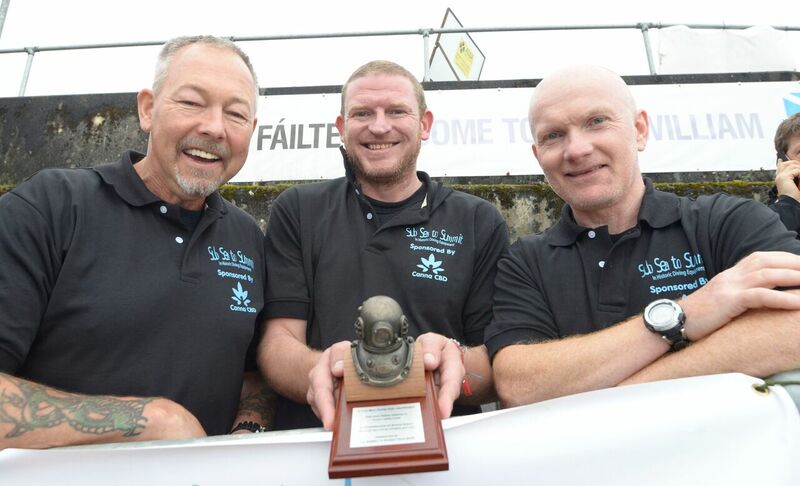 On first hearing about the idea his first comment was “let’s make it happen!” Next on board was an old diving mate Tim Kite who involves himself more and more in crazy adventures and sponsored the project as soon as he heard about it. Wanted: men for hazardous journey; low wages, intense cold, long months of darkness and constant risks, return not certain. Shackleton’s quote could well be adapted for a project such as this. Never the less a small band of men and women got involved maybe, knowing me, more out of curiosity than anything else. Some I knew but many I didn’t but the most remarkable thing about this whole journey is the team on the mountain, those who came and went have shared a unique and crazy experience that may only come around once in a life time. 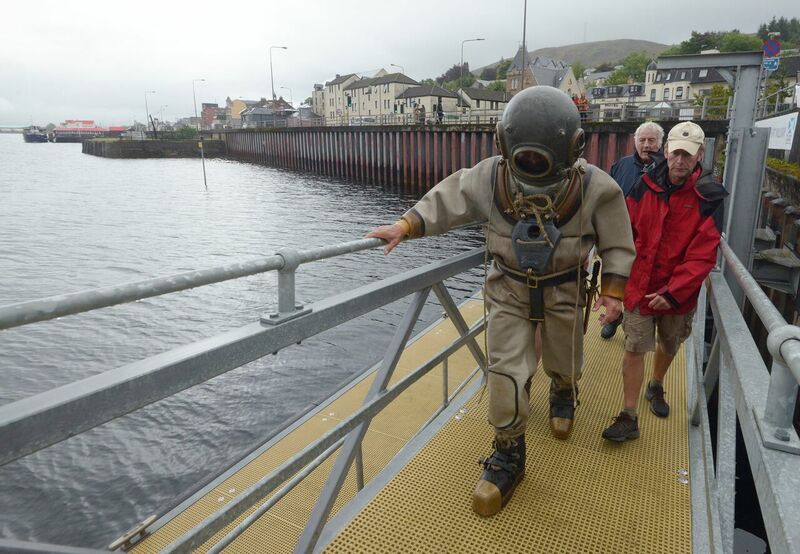 Ty started the Subsea to summit project with a dive off the Marina and shoreline companies pontoon on the shore of Loch Linnhe at 10:00am the 1stSeptember. We were planning at least 4 days. The first day saw us go the 2.5 miles through town to the Ben Nevis Information Centre at the base of the mountain. 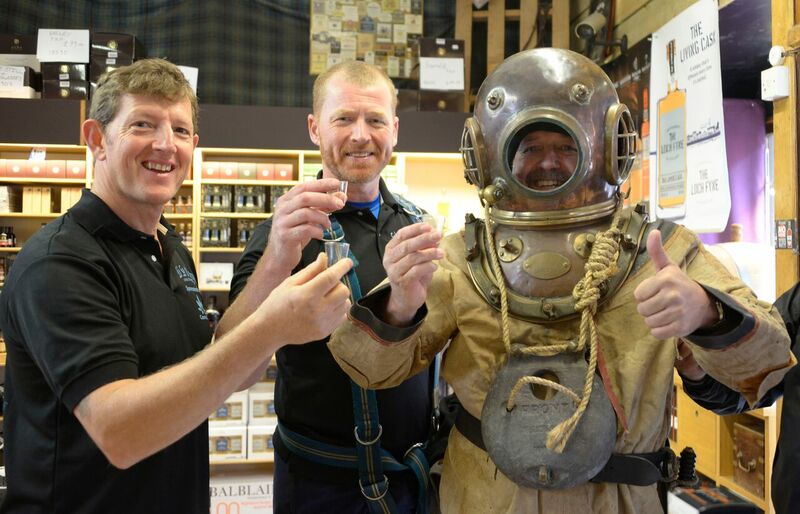 Dean ‘Simmo’ Simpson who had set up the crowd funding site amongst helping out in numerous other ways timed his stint in the suit well as he called into the whisky shop on the high street for a tot of whisky. Simmo had also roped in Zac his youngest son who also had a couple of stints including on the mountain making him the youngest at 19 years of age to carry the kit. Ex CD and MCDO Paul Guiver was involved early on and volunteered to do anything asked of him. Paul also donated a plaque underneath a miniature standard hat which will be presented by Tim to the Seal team involved in the cave rescue in remembrance to Saman Kunan. Others took their turn as we made very good time to the information centre. Meg, only the second female Clearance Diver to qualify in the Royal Navy arrived at midday by train keen to be involved. After a change of shoes she was soon wearing 176lbs of diving equipment and took her turn right up until the summit. As a Leading Diver I would not expect anything less from a fellow CD. She fitted into the team in an instant and added a constant smile when ever anybody talked to her. John from the HDS, quiet and unassuming supported us throughout the trip just wanting to be part of the madness as did Rodger another HDS member who at 71 years of age was the oldest to do a stint. We were soon back into a cold wet suit but the day was clear and we could sense success. The difficulties of walking in the weighted equipment puts you in a situation where you first abhor it. You can’t stand it. It’s terrible. But you can’t get away from it. So you stick with it. And then you get so that you tolerate it. You tolerate it long enough, you embrace it. It becomes your way of life.– Qoute by Lewis Hayes, LCDR, Medical Corps, USS Indianapolis. We were now down to 6 walkers in the equipment but were bolstered by three support crew from my RNR unit HMS Dalraida, Brian Jones, Stevie Allan and Brian Cartlidge. Having arrived on the Sunday to prepare the team dinner they slotted right in without being asked and carrying equipment to free the walkers up. Brian’s Jones sense of humour (Bootie) kept all going as did the surprise bottle of rum they donated to us at the summit. A big presence on the team was Nigel and that’s in personality as well as size. From Wigan he was a tough ex Rugby League player in the past and was looking for new challenges. The last member of the team that I haven’t mentioned yet is an American climber that I recently met whilst climbing an unclimbed mountain on the Marinas Islands in a remote part of the Pacific. He liked the idea of giving himself a hard time and flew over for the pleasure and pain of it all. Gary is an American of 30 years old who is in the process of completing all the state highest points. Putting him in an 176lb suit hardly slowed his process at all. He did the longest stint of anybody at a guess, 300 metres or so. He is either super human or the Terminator and also had a knack of getting people to part with their money for the cause. 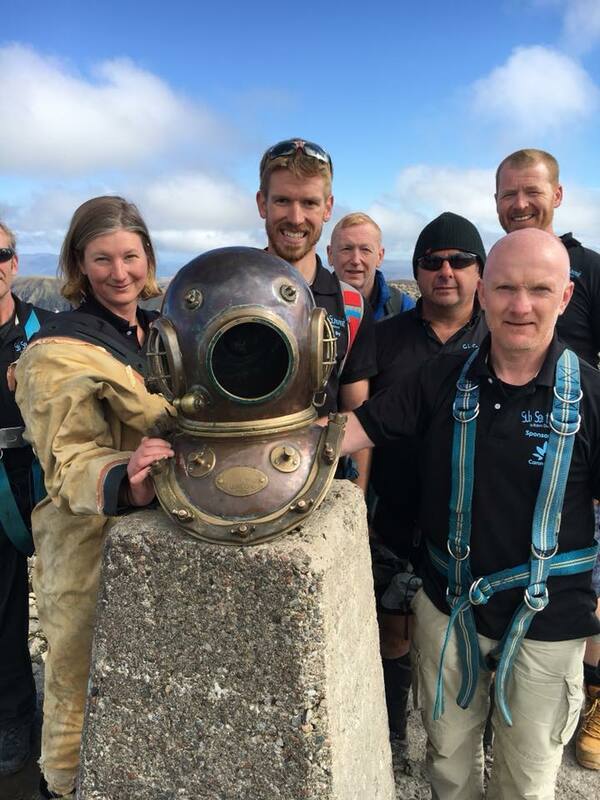 The final 100 metres leg of the Subsea to Summit project fell to Meg to climb the summit Cairn and for us to be the first team and possibly the last to reach the highest point in the UK in Standard Diving equipment. It’s the hardest things in life that you remember the most and that is so true but to share it with such a team makes this all the more special. It’s been a pleasure to part of the Subsea to summit team. 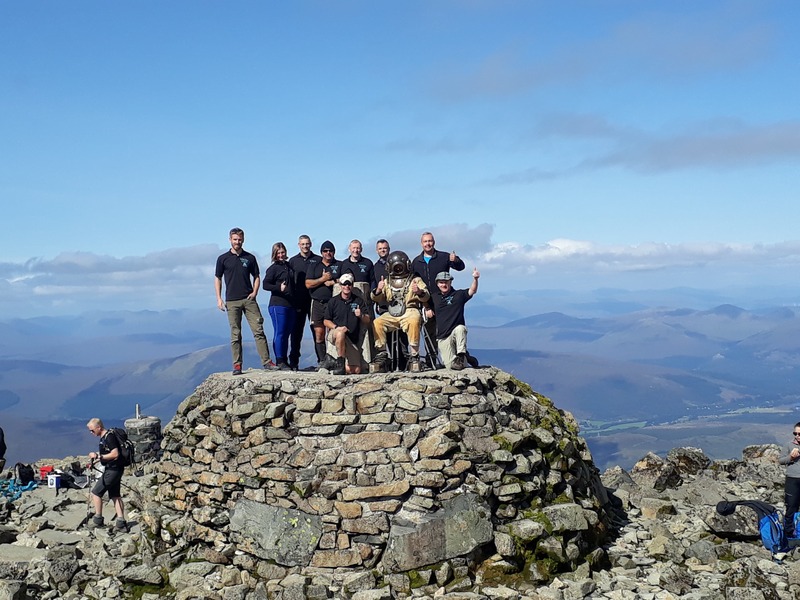 We came and achieved the aim of the Subsea to Summit Challenge and in the process raised over £6000 and counting toward the three charities. Part of really wanting to do this challenge was for the adventure and the rest for those who never thought it was possible. Only those who risk going too far could possibly find out how far they can go. 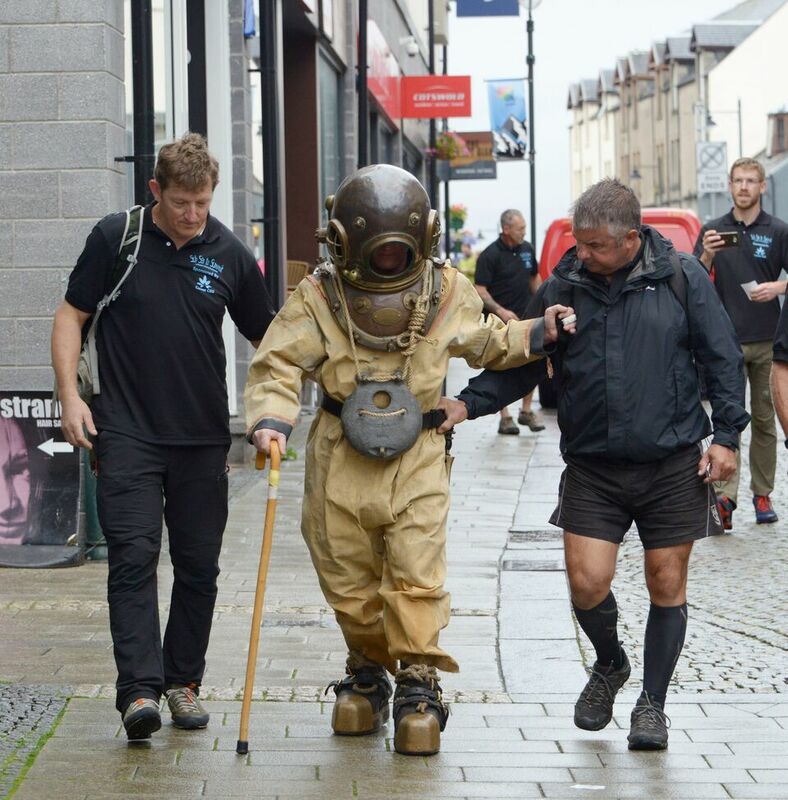 All funds raised will be distributed evenly between; The Historical Diving Society, The local Lochaber Mountain Rescue Team (LMRT) and the family of Saman Kunan, the former Thai Navy Diver who tragically died, while taking part in efforts to rescue 12 boys and their football coach trapped in a flooded cave in Thailand. If you would like to donate please visit their website.